Soldiers Inc is a Browser Free to Play MMO RTS, developed by Plarium. A battle between dozens of shady business corporations has reached the war-torn state of Zandia, battle fought by private military’s and mercenaries trying to claim extremely valuable territory where huge amount of minerals have recently been discovered. To establish a military base of operations and claim these valuable mineral is for your employer by any means necessary. As but one contender in this theatre of war you must work towards defending your own territory and base as well is wiping out the competition and aligning yourself with other commanders to perform a stronger coalition. 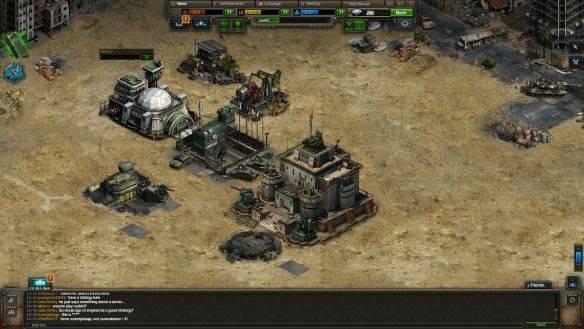 Soldiers Inc is a strategy based MMO game that can be accessed through Facebook or directly through your Internet web browser without any need of a client download. The game revolves around players gathering resources, constructing buildings for their base and training up new military units to both aggressively fight for control of resources and defend their own base. Whilst free to play there is a premium resource option in the form of Diamonds that players are able to purchase with real-world currency that can be used to speed up processes, buy unique buildings or even purchase needed resources among other things. To survive the threats of the game, typically found in the form of aggressive NPC AI or worst of all other players from around the world, players must build up their own base of operations constructing a variety of different buildings from defensive walls and gates, offensive turrets or resource production buildings to help them grow, expand and upgrade. Resource acquisition is one of the key components to the game, needed for constructing almost every building or training every unit as well as used as the maintenance currency to keep your army marching. Players will be able to produce their own resources, even upgrading buildings to produce resources in far greater quantities, but ultimately a good commander looks for other sources to bring in what they need. To keep their base running players will have to look towards other players, either joining a “Combine” play Alliance and trading between friends or looking to raid other rival players and try to steal their enemies resources for themselves. Players are able to build up their own army made up from defensive units (typically used to defend their own base) or aggressive units used to perform raids on non-friendly outposts. Players can raid bases to gain resources, having a 10 raids cap that once reached means they will gain no more resources from attack (but can still continue to attack if they wish) and must wait for their Raid attempts to replenish, which does so at a rate of 1 extra raid per 2.5 hours. Successful players and Combines a solo work their way up the rank ladder, the leaderboard which shows which players and organised groups are performing the best in the game offering both the prestige of being the most notorious name in the game but also rewarded for their efforts.